Personalized Duck Shape Address Plaque - - custom made address sign for your home or business in the shape of a duck decoy. Made in USA. Are you an avid duck hunter? Do you raise ducks or enjoy watching the ducks float in the neighborhood pond? 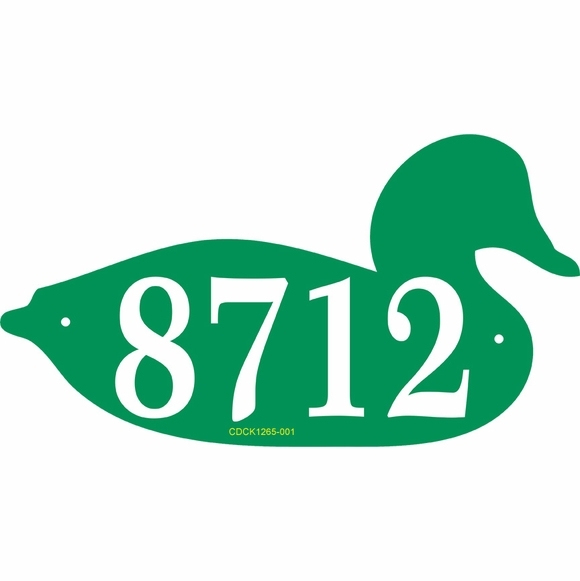 This duck shaped address sign is a unique and very personal addition to the home of anyone with a passion for ducks. 12" x 6-1/2" duck sign with one line of personalization. Wall mount. Special shape. Holds one line of up to four (4) 3" characters. Note: the style number you see on the sample duck is for internal use only and not part of your custom sign. Dimensions: 12"W x 6-1/2"H x 1/8". Personalized duck decoy address plaque crafted in the USA. Click the links in Related Products to see more special shape novelty signs.